The “Miracle On Ice” 1980 Olympic hockey game between the U.S.A. and Russia is regarded as one of the greatest upsets in sports history. It took place on February 22, 1980 and was played between amateurs (the U.S.) and professionals (Russia). The U.S. team was a huge underdog going into this game, but they ended up beating the Russians by a score of 4-3. What’s less known about the “Miracle On Ice” team is that it was made up of mostly Minnesotans, with 13 of the 20 players on this team born in Minnesota. The team was led by coach Herb Brooks, a Minnesota native who had coached the University of Minnesota Golden Gopher hockey team to three NCAA National Championships leading up to the 1980 Olympics. Much has been written and said about the “Miracle On Ice” game, but what’s unfortunate is that younger generations may not fully appreciate why this was such a huge game, both athletically and politically. The “Miracle on Ice” game became a symbol of American resolve in an era of apathy and growing U.S. / Soviet tensions. This game became a catalyst of national pride during a very uncertain period in American history. Defenseman. Attended the University of Minnesota. Played in 143 regular season games on four different NHL teams over three seasons. Became a oral surgeon and maxillofacial specialist. Head Coach. Member of 1964, 1968 U.S. Olympic Hockey Team. Coached in the National Hockey League. 1990 U.S. Hockey Hall of Fame. Died in a single car accident in 2003. Center. Enjoyed a 17-year NHL career. Led the Minnesota North Stars to the Stanley Cup finals in 1991, played for the 1995 Stanley Cup winning New Jersey Devils. Was first U.S. born NHL player to achieve a 100 point season. Now manages a horse farm with his wife. Center. Attended the University of North Dakota. Played in the NHL for 14 years. After his hockey career ended in 1993, Christian turned his focus to coaching. Right Wing. Attended the University of Minnesota. Played 248 regular season games in the NHL over 5 years. Christoff later worked as a pilot. Right Wing. Attended the University of Minnesota-Duluth. Credited with the assist on Mike Eruzione’s go-ahead game-winning goal against the USSR. After his playing days were over, he moved into coaching and is now the coach of the Slovenia men’s national team. Goaltender. Attended the University of Minnesota. Played with the Minnesota North Stars and Colorado Rockies in the early 1980’s. Center. Johnson was pivotal in the Americans game against the Soviet Union, scoring goals in the first and third periods to help the U.S. get the win. Appeared in 669 NHL regular season games between 1980 and 1990. Currently head coach of the University of Wisconsin women’s hockey team. Left Wing. Attended the University of Minnesota. Scored five goals in seven games during the 1980 Olympics. Played in the NHL for the Buffalo Sabres, New York Rangers and Hartford Whalers. Later became a financial broker. Center. Recorded an assist on the game-winning goal against the Russians. Attended the University of Minnesota-Duluth. Played in the NHL for New York Rangers (1981-86) and Minnesota North Stars (1986-87). Left Wing. Attended the University of Minnesota Played on the 1980 Winter Olympic “Miracle on Ice” hockey team and received the Gold Medal. Also a member of the 1976 U.S. Olympic hockey team. Played in the WHA. Later worked as a sales executive. Right Wing. Member of the 1979 University of Minnesota Golden Gophers NCAA championship team. Worked as a sales executive and coaches youth hockey. Left Wing. Played for the University of Minnesota. Turned down offers to play in the NHL and instead continued his career in Europe. Later pursued a career in banking. Defense. Bowling Green State University. Right Wing. Captain. Boston University. Center. Bowling Green State University. 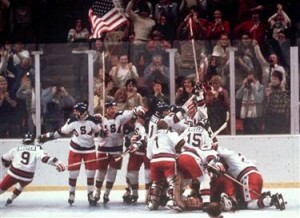 The “Miracle On Ice” game against the Russians was not the Gold Medal game. The Gold Medal game for the 1980 Olympics was two days later when the U.S.A. faced Finland. Team U.S.A. won 4-2 and took the Gold Medal. Soviet coach Viktor Tikhonov was so enraged with a fluke goal against the legendary goalie Vladislav Tretiak that he immediately pulled Tretiak. This had a huge motivational impact on the U.S. team because they no longer had to face Tretiak during the game. The second period was utterly dominated by the Soviets, and Team U.S.A. had over six minutes of penalty time during this period. The line of Mark Pavelich, John Harrington, and Buzz Schneider was referred to as the “Conehead Line” because their style of play was “alien”. All three players were from Minnesota’s Iron Range. Team U.S.A only had 16 shots on goal, compared to Russia’s overwhelming 39 shots. I was not born when this happened, but this is my favorite 20th century sports moment. If you’ve ever seen the movie, the move creators and the actors worked just as hard as the original 20 players. I was serving on board a US Navy ship during this period. Name of vessel is still classified. However, they were able to stretch a big projection screen up on the hanger deck. We watched this tape. And to this day, I cannot understand how shocked we all were over the victory. Not a single one us jumped up to cheer. We could only sit and look at each other and wonder why not one of us jumped up screaming for joy. Perhaps the most momentous occasion in my life, the “Shock of Silence”. The other one is having watched ALL Apollo missions LIVE.